There is nothing more fun but to spend a Sunday afternoon with some beers and a good movie. Well, not for everybody maybe, but for the ardent Homer Simpson fan, it is bliss. So I went over to the local grocery store and grabbed myself a six-pack and thought of picking a movie from the Red Box station at the store. Not too many choices were available and I picked up ‘The Cove’ absolutely not knowing what was coming my way. While growing up, I often traveled to the Andaman and Nicobar islands to visit my grandmother and cousins who lived there.We would often make the journey by ship and when the seas were on our side, it would take us 3 nights and 4 days to reach Port Blair, the capital. While most of my family suffered from sea-sickness and spent most of their time in the cabins fighting their nausea, I used to cherish each and every moment of the rolling and pitching journey. I never felt seasick and would spend most of my day on the deck, holding the rails and watching the vast expanse of the Bay of Bengal. Nothing is more humbling, but to see this gigantic mass of water, sometimes glistening, as the rays of the sun kiss its surface and at other times turning into white foam as the waves crash on its surface. The beauty of the ship creating white foam every time it cut through the black waters and the melody that those crashing waters create with every forward movement was a surreal experience for me. But what kept me going for hours and hours on the deck was the anticipation to spot a fish in the ocean and if I were lucky, maybe, spot a dolphin. There is something insanely exciting when one sees an animal in its own habitat. Maybe because then, the animal has its sense of freedom and the sense of freedom brings out the best in it. Oftentimes, I would play a “spotting” game with other co-passengers in the same age group as myself. We would simply stand out on the deck and try spotting the inhabitants of this mystifying ocean. “There is something”, a spotter would shriek out and all the curious eyes would turn to a particular direction, simply to find out that it was a mere illusion or some rubble in the sea. But one day, on one such voyage, things changed. While we were having our breakfast in the dining halls of the “M.V Harshavardhan”, the captain’s voice came blaring out of the P.A system : “Passengers, there is a school of dolphins on the starboard side of the ship”. Commotion ensued when everyone decided at once to catch a glimpse of the beloved creatures in the wild. I rushed to the balcony of the dining hall hoping to catch a glimpse of these creatures for the first time. And there they were. A little distance away, three or four dolphins were swimming without fear, without malice, without harmful thoughts, without complexities, without issues. Just disappearing under water and then jumping back up again, in complete harmony, as if, trying to entice the onlookers to join them in their enormous playground. That was my first glimpse of the dolphins. Dolphins as seen in the wild. That lazy Sunday afternoon I saw ‘The Cove’. And I was disturbed. The very idea of having a beer and enjoying a movie was vanishing as the movie progressed and I was filled with an amalgam of emotions fluctuating between anguish for the creatures, being inspired by the courage shown by the crew and cast of the movie, yet utterly frustrated and angry towards the ignorant Fisherman’s Union of Taiji. The dolphins I had seen in the wild when I was younger were now frantic. They were not swimming playfully, but struggling to save their lives. They were not chirping in joy, but squeaking in pain. Yet, they were in their own playground – the immense ocean, which itself had turned red and was not able to hide the brutality of the merciless killings even in its vastness. 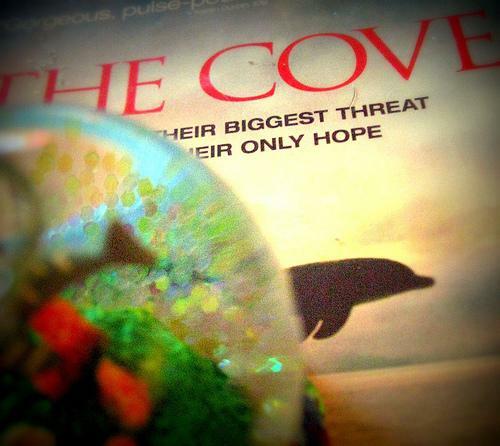 ‘The Cove’ stirred me from within because on one side it showed the “coldness” of the human heart – the deceitful trickery that lures the innocent dolphins into a ring and then mercilessly hacks at them till the oceans turn red. But on the other side it showed the courage and passion that the same humans show towards saving another species. For me, regardless of the disturbing behavior of some humans, the movie still gave hope that there will be someone from amongst us mortals who will stand up and say “NO” when something wrong is happening. And something wrong is sure happening. Its happening in ‘Taiji’ and probably many other parts of the world. have added a link to the documentary here so you can watch it. Since I watched ‘The Cove’ I have always had the desire to participate in the cause to help dolphins and whales. A few months ago, I met the founders of the Champions for Cetaceans and thought of expressing myself through a common forum that is fighting towards the same cause. As I am writing my first blog, the International Whaling Commission is preparing to meet for its 63rd annual meeting from July 4th to 14th in the Channel Islands. Unfortunately, the IWC currently does not regulate the catches of smaller species of whales, dolphins and porpoises, known as the ‘small cetaceans’. Well, that is a problem. And if nothing else, such rules allow for the brutalities towards these species that have and continue to happen in Taiji. There is an immediate need for an international body to help conserve and manage these species. The IWC can certainly step up to that role and help save the whales, dolphins and other endangered ‘small cetaceans’. I found a wonderful article on examiner.com that brings forward the issue of saving whales and dolphins and how the IWC can play an important role. The above article also led me to a social media group Save Misty the Dolphin who are also fighting towards the same cause to protect the dolphins. The group has actually issued a letter to the IWC secretariat and encourages concerned citizens around the world to join the cause and submit similar letters. I am sure going to send one and it would be of great help to these beautiful creatures if you could do the same. In a few days, when we get together with friends and family on the fourth of July and watch the fireworks to celebrate our independence, I hope we think just once for the dolphins and think about their independence from human brutality. A small action on our part can make a big difference and possibly let these creatures be safe, secure and free in their environment. Lets hope we can change things so the IWC considers including ‘small cetaceans’ in its list of endangered species. Lets ensure that in future there will be a child who will be equally mesmerized as I was by seeing a dolphin swim freely in the sea. For reference, below is the letter that Save Misty the Dolphin is sending to the IWC secretariat. Join the cause and help protect the dolphins!! As the dates of the 63rd meeting of the International Whaling Commission approach, July 4-14, 2011, in the Channel Islands, we are writing to urge the IWC to take strong and decisive action to fully protect whales AND dolphins. The slaughter of whales and dolphins for commercial, scientific or cultural purposes is inhumane and highly inconsistent with worldwide efforts to protect our planet’s oceans. Numerous reports have proven that whale meat is highly toxic with mercury. Furthermore, the March 11 tsunami and nuclear disaster in Japan resulted in radioactive water being dumped into the sea. According to a June 15 article published by the Associated Press, two Minke whales caught off of the coast of Japan were found to have traces of radioactive cesium. In the interest of public health, it is time to end the international consumption of whale and dolphin meat. uncovered a wealth of improprieties conducted by representatives of the Japanese delegation. We request that investigations be undertaken and that appropriate and harsh sanctions be levied against the guilty parties. Such behavior simply should NOT be allowed within the confines of an international regulatory body. 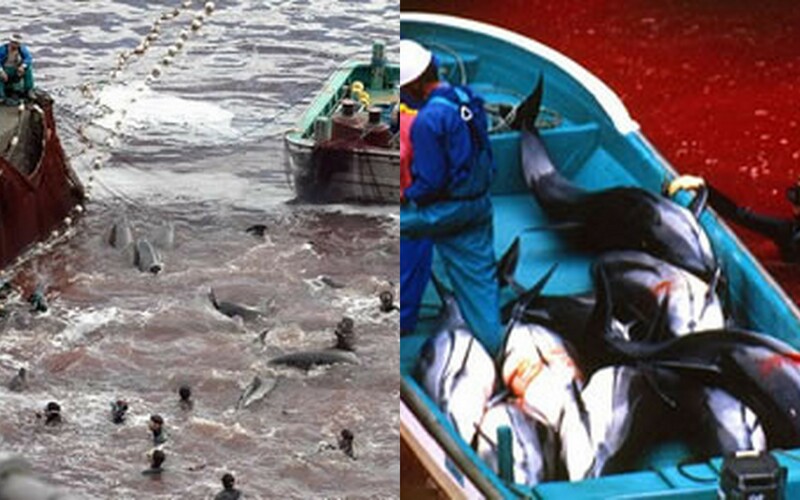 the Taiji Fisheries Union is among the most cruel practices known to mankind. Like whales, dolphins are intelligent beings. They live in pods and nurse their young. We have witnessed pods of dolphins herded into the cove and then slowly and painfully slaughtered over the course of many hours. Calves swim in the blood of their mothers and fathers. This nightmare simply must end. We call on the members of the 63rd International Whaling Commission to fully PROTECT all whales and dolphins. The time to END whaling and dolphin hunting on planet Earth is NOW. This entry was posted in Cetaceans, Dolphins, Porpoises and tagged Cove, Dolphin, dolphin slaughter, Japan, taiji by Kirsten Massebeau. Bookmark the permalink. The paragon of undertasnding these issues is right here! My life too, was forever changed by watching “The Cove”. I remember sitting stunned for at least an hour after it. I don’t think I enjoyed a full night’s sleep for weeks. It was that movie that turned my direction in life. I have met and met online so many like minded people like your self, Sandy, Colin and so many many others, willing to endure much negativism,derision and scorn to take a stand for these creature, and all other animals enduring cruelty, abuse, murder and captivity. Thank you for sharing your experience and drive. Thanks Marianne for reading the post! Yes, indeed. As I mentioned in the post, watching “The Cove” was really an awakening experience for me. I hope I can inspire many others to join our cause and help end this cruelty. Thanks Colin this is Ed I just added you to my facebook friends and thanks too for your comments about Jaideep. He in my estimation is unusually gifted and will certainly draw others to the cause as I mentioned to you on FB. Thanks Colin and Thanks Ed for your kind words! Jaideep, as a member of the Save Misty the Dolphin Team I am humbled by your response to our efforts. Like you, The Cove movie brought me here. At Save Misty, we are commited to doing everything we can to END the slaughter & captivity of marine mammals. SO GLAD to have you with us. I believe in the power of you and I. Thanks Sandy! and sorry for replying so late. I am just swamped with work currently. I think the work you are doing is great and I will be glad to help in whatever way I can! Thanks for reading the post! Indeed the story you mention is disturbing and opens our eyes to the attitudes of many towards these issues. Thank you for your blog. You write intelligently about an issue that stirs passion on both sides. The true issue is doing what is best for the world we all share and all the creatures — both man and non-man. And so, therefore, writing as YOU do is very helpful to resolve this issue. Thank you. I “borrowed” part of your letter to the Whaling Commission and will tweak it before I mail it. Thanks again! Thank you Catherine for reading the post and sending the letter. I hope these small actions end up making a big difference.